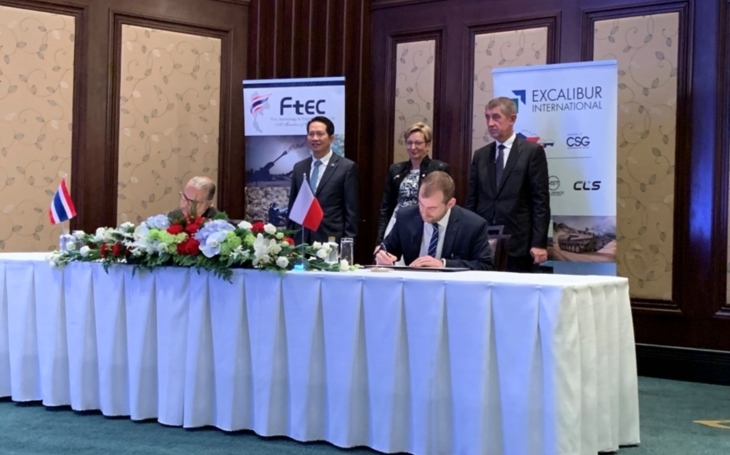 During Czech Prime Minister Babiš‘ visit to Asia, the Excalibur International, part of the Czechoslovak Group (CSG), signed a memorandum of understanding with the FICO Corporation in Thailand. The document mentions collaboration concerning deliveries of armoured vehicles and production, sale and eventually servicing of the TATRA vehicles. Excalibur International focuses on trade with both military and civilian vehicles and aircraft, as well as with special material including complex logistical processes; deliveries of residential, medical and other specialized containers; tactical training of military and law enforcement special units. Thai-based FICO group conglomerate’s subsidiary for defence is the FTEC (FICO Technology and Engineering), and represents a strong partner in the region in the domain of land military equipment. It is also commercial representative of many producers of military systems from NATO member states, and holds own production capacities. „This memorandum is another step to strenghten the cooperation of our company and our Thai partner in promoting the products of the Czechoslovak Group holding’s members in South-East Asia, not just in Thailand,“ Radim Petráš, Excalibur International’s CEO, said. It is not the only activity of CSG in the region. We’ve already mentioned in November that Excalibur Army presented the Pandur II CZ in the Infantry Fighting Vehicle (IFV) configuration in Indonesia during Indo Defence 2018. Prime Minister’s visit to Thailand brought agreement on establishing a working group with focus to up joint defence industry projects. Military-aerospace domain was mentioned specifically. The Royal Thai Air Force operates 24 Czech L-39ZA Albatros jets in light attack, surveillance and reconnaissance operations, and might be interested eventually to purchase the L-39NG, unveiled in October 2018, with the first pre-serial L-39NG’s first flight on 22nd December at Aero Vodochody Airport. In the past FTEC has also entered in agreements with NIMR Automotive, a Abu-Dhabi-based military vehicles manufacturer, concerning evaluation trials of the Ajban 440A and Ajban LRSOV. NIMR Automotive’s partner for Central Europe and V4 countries is another Czech company: VOP CZ. NIMR RIV (Rapid Intervention Vehicle) has been introduced during the IDEB last year. Besides the L-39ZA the Royal Thain Army (its Special Forces) uses also the CZ 75 pistols by Česká Zbrojovka.